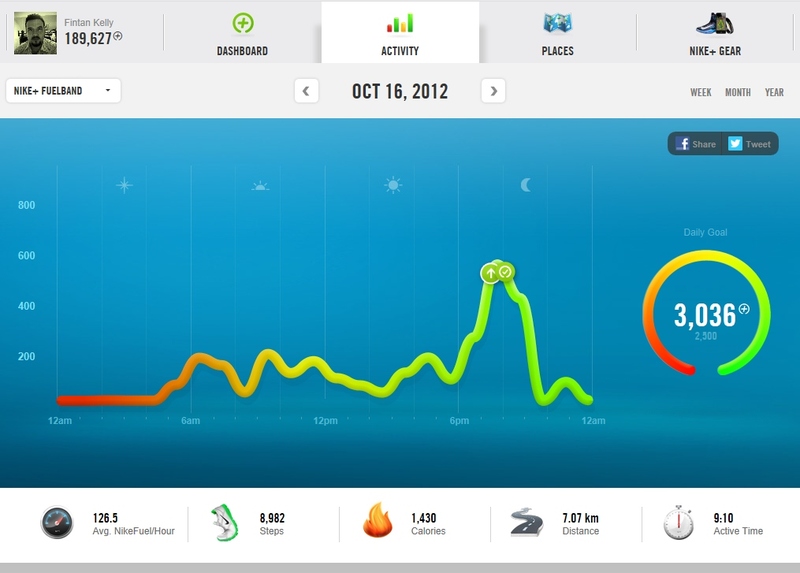 You are here: Home » The Nike Fuelband – A daily reminder of just how lazy you are! 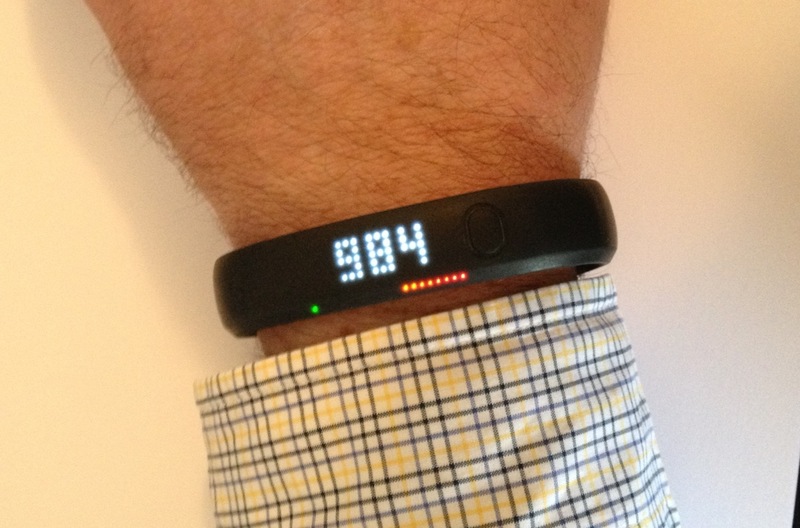 The Nike Fuelband – A daily reminder of just how lazy you are! The idea of constant 24 hr feedback on daily activity has always intrigued me especially as our lives become more and more sedentary. Pedometers have been around for a while but with the latest improvements in technology the growth in offerings for personal activity recorders has vastly improved. I picked the Nike Fuelband from the options as its worn directly on the body (right or left wrist) versus attached to a piece of clothing or a belt which doesn’t appeal to me. It is always on and recording my activity, aside from when I have it charging or updating on the laptop, so it gives a great insight into a 24 hour window of activity without being specifically focused on steps. The device is very easy to use with a single button bringing up all displays and controlling all options. The device itself will show you readouts at the touch of a button on Fuel(an activity calculation), Calories, Steps and Time. You can also disable the Bluetooth for when in flight and it gives feedback on battery level to warn when you need to charge. The battery life is excellent and I only need to charge every 3 or 4 days. 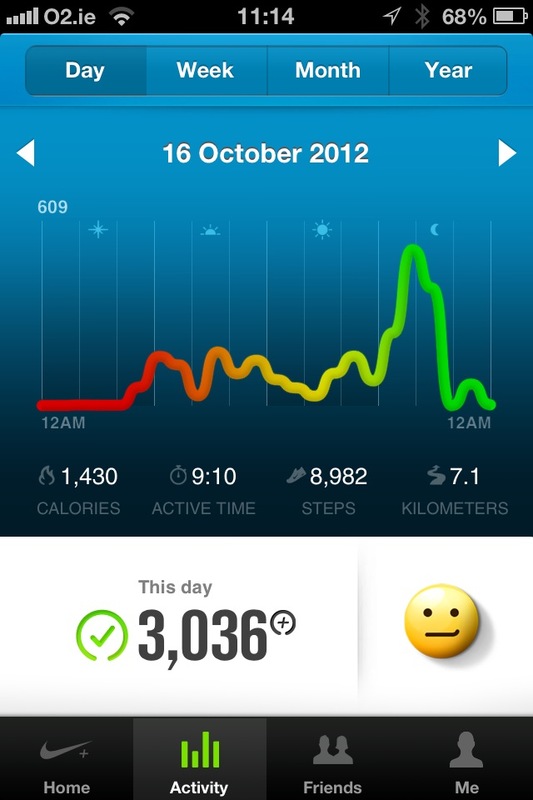 I sync it daily with my iPhone Nike Fuelband app to upload the data to my Nike+ account. See screen shot below from the iPhone of data display for a particular day. The screen shot below is from my Nike+ web account. It gives a nice breakdown of activity over the whole day showing number of steps, calories, distance and when you were most active similar to the iPhone app above. As with other Nike apps you can set targets and challenges and share your progress across Twitter or Facebook. My Nike+ web account has the added advantage in that it pulls together the info from my Nike iPhone App and the Fuelband (and other Nike tracking devices if you have them). I wanted to try these 24 hr monitors to get a better sense of my activity(which is not a lot!). Working on a computer all day combined with relatively long commutes and small kids can leave very little time to indulge in multiple trips to the gym each week. Even at that when the health fit kicked in it seemed hard to shift all those pounds that have added on over the years. The Nike Fuelband has given me a much better insight into my average and particularly worst days. It has reinforced the fact that a number of small things over a whole day versus 3 or 4 trips to the gym every week can be significantly more rewarding from the health point of view. All common sense stuff but when the figures are thrown in front of you on a daily basis and you can analyze the last day, week and month it can be quite shocking and eye-opening. My worst days were those I worked from home. There is obviously no walk for the train, to the car, to the bus, to the office and then to meetings or lunch. I go from my kitchen to the attic conversion and sit in front of the computer from maybe 7am or 8am until 5pm or 6pm. With a couple of breaks for lunch and a cup of coffee. I normally got a score of 400-600 Fuel points on these days. That compared with an average work day of about 1800 Fuel points or a Saturday cutting the grass, playing a game of tennis with the kids and just doing a few bits around the house where I would score over 3000 Fuel points. Other simple small changes like the healthy heart ad states ‘get off a bus stop earlier’ can make a big difference. Wise words, common sense and very obvious but I (we) all too often hear these messages but don’t action them. Amazing over a day how a number of these small changes can help you hit your fuel target easier than trying to make time for a trip to the gym. So the device won’t lose the weight for me but it might just be that piece that reinforces the serious need for a whole lifestyle habit change and helps me do it at a more consistent level across my day versus spurts a few times a week. If considering buying there are a few things to note. If your main activity is biking or swimming then this is not the device for you. Its worn on the wrist so I am not sure if on a bike how accurate it would capture your activity if at all. Nike state you can shower with the device but it’s not waterproof. So swimming is not an option which frustrates me a little as I do like to go for a swim. Also I haven’t had the cojones to wear it in the shower for fear I kill it. In my head if it’s not waterproof then it stays away from water, showers included! Feedback for Nike and improvements? Continue to improve on the Nike+ web piece. While it has improved greatly over the last year they should(will)) continue to develop and they should add some features like weight tracking and body measurements. So that is it. I think it’s a great piece of tech and when used correctly could really help some of us to improve our lifestyle on a more consistent basis. The fact it is a 24 hr all day tracking system means its a lifestyle monitor for anyone to use and learn from and not just a piece of gear for serious runners and athletes. People have made the odd comment such as ‘oh you can fool it by shaking your arm!’ but in these cases it’s not really the device you are fooling. When it’s used as it is designed it really is an excellent, easy to use, put on and forget piece of tech. Highly recommended for those so inclined! This wrist band looks like it has the potential to be a great motivator; on the other hand, as you said, it could make you a little lazy as well !